This web page took two to three hours to scan, research, and design. Thank you for supporting the Virtual Steam Car Museum! R. S. Whitney made only three cars during his six-year manufacturing period. The first two were conventional 2-cylinder steamers, a two passenger runabout and a four-passenger surrey, but the last model.in 1905, showed some originality in having a front-mounted boiler and integral construction of body and chassis. 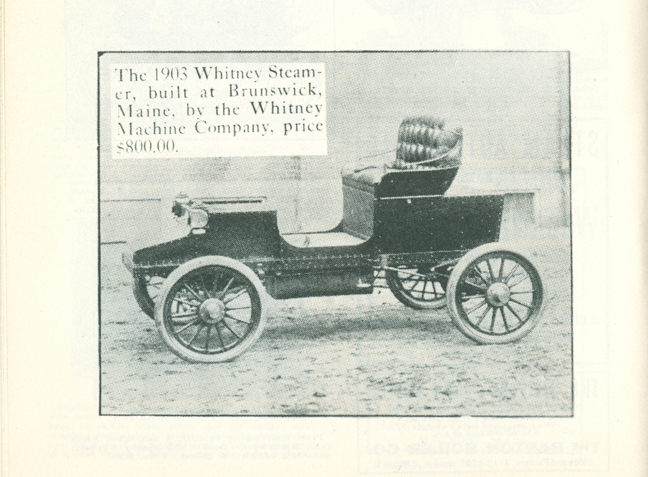 R. S. WHitney of Brunswick, ME built this steam car in 1903. Between 1899 and 1905, he built three steam cars that he sold locally. Georgano, G. N., Encyclopedia of American Automobile, (New York, E. P. Dutton & Co., 1968), p. 206. Kimes and Clark have additional information on Whitney and his three steam cars. See: Kimes, Beverly Rae and Clark, Henry Austin Jr., Standard Catalogue of American Cars, 1805 - 1942, 3rd Edition, (Iola, WI, Krause Publications, 1996), p. 1542. Did you enjoy The Virtual Steam Car Museum? Please make your tax-deductibleDONATION today to help keep the VSCM up and running.